After his checkup, the doctor called the wife into his office alone. 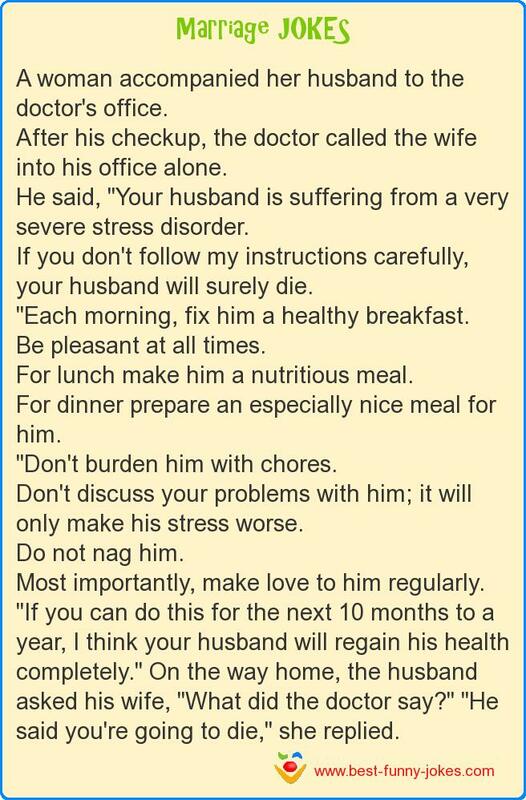 He said, "Your husband is suffering from a very severe stress disorder. If you don't follow my instructions carefully, your husband will surely die. "Each morning, fix him a healthy breakfast. "Don't burden him with chores. Don't discuss your problems with him; it will only make his stress worse. Most importantly, make love to him regularly. "If you can do this for the next 10 months to a year, I think your husband will regain his health completely." On the way home, the husband asked his wife, "What did the doctor say?" "He said you're going to die," she replied.